There are many photographs in this collection that freeze situations in time that amazed me, especially thinking how things got done back then compared to living in the 21st century, remembering some of my own experiences during that time. 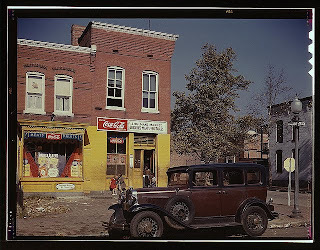 I included one picture here, of Shulman's Market on Union Street in Washington, D.C. in 1941, which took me on an unexpected journey. It immediately (well almost) produced about 38,000 results. The company's webpage indicates that it now belongs to Redco Foods and one can buy a case of Salada tea for $26. It must be a small case, considering the price of tea lately. Wikipedia gives a more historical account of this company. It was founded in 1892 by Peter Larkin whose claim to fame was that he packaged his tea in foil instead of the loose-tea distribution model that was common at the time. Peter claimed that his tea was fresher and, I suppose, he would also have claimed that it would be as clean as it was when it left his factory. It worked because his tea became wildly popular. I couldn't help but wonder whether he patented his packaging method. Other interesting posters in the windows are Prince Albert Crimp Cut long-burning pipe and cigarette tobacco as well as propaganda posters of Hitler, Mussolini and Yamamoto. The posters of the latter trio weren't clear, so I didn't bother enlarging them. Based on folks who claim to have been there, the propaganda included phrases such as "What do you say now, America." Fascists and despots who are bent on taking our liberties away may ponder the course of history that followed those words. 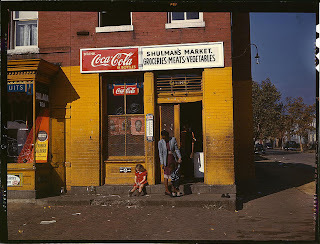 Googling Shulman's Market produced over 400,000 results and I clicked on the very top one that had a copy of the picture above in its main page (http://www.shorpy.com/node/117). It also has comments from folks who knew the store and lived in the area. I added shorpy.com to my favorites with the intent of browsing around a bit more later. 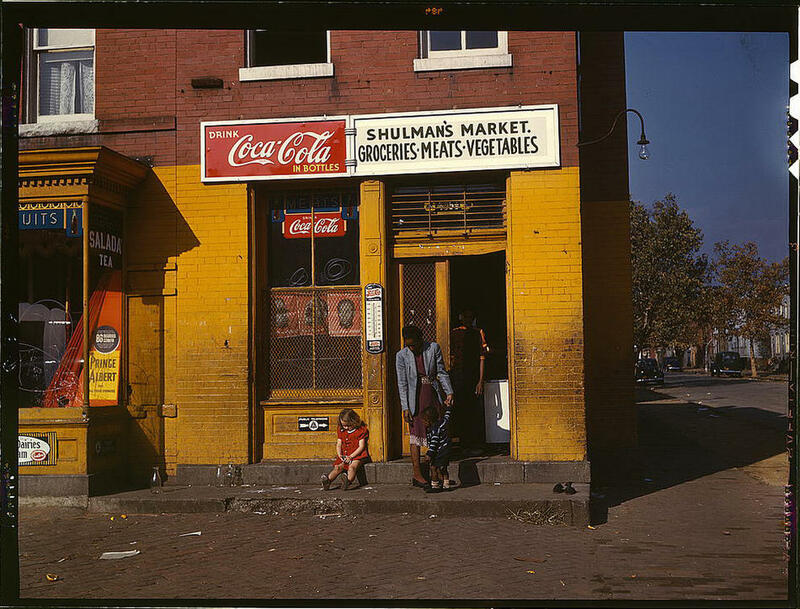 The Shulman's Market image is one of the more complex FSA images. The unfinished story of the little white girl sitting forlornly while the black mother and child stare, is compelling. 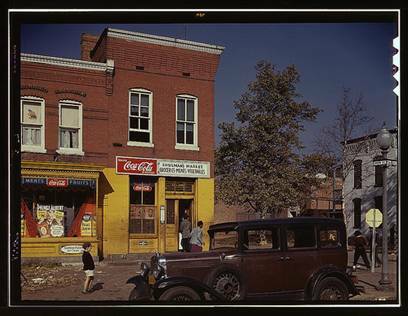 Rosskam photographed many store fronts in Washington D.C. as well as farms and small communities. Even though I make a living delving into and scouring the Internet, some things never fail to amaze me. On another site I found a photograph of the same store taken a few minutes after the other one. In the time it took Louise to walk back across the street and set up her camera and tripod, another little girl walked over to the white girl to talk to her. She moved over a little bit, too, so it was a conversation taking place between the two girls. Enlarging the image by clicking on it reveals that the new girl might be showing a doll to the forlorn girl - it is not clear. Some sites contained photographs in which folks wanted to verify that the car in front of the store is a 1931 Chevy. They even published restored similar cars that matched the one here. In another site I found yet another photograph of the same store, taken perhaps a while later as the little white girl is now gone and other people moved into the photograph. Louise hasn't moved, however, as can be seen from where the top of the Chevy's windscreen coincides with the corner of the building and the black women with the gray sweater is now walking away from the store. When I spend my leisure time on the Internet after having worked 50 or 60 hours on it during the week, I am reminded of pilots who fly away for some relaxation. It has to be in the blood. For now I have stopped looking around for old pictures on the Internet because I get frustrated when it takes Google longer than one second to produce a half million results. What are we coming to? Nevertheless, I encourage those of you who like to look back at history (and perhaps cross paths with times that you can remember) to visit these sites. For me it was a reality check that I want to check off regularly.